Entry is now entirely online, starting on this page. You can enter up to four categories. Choose your category below. Then go to the ‘ENTER NOW’ button below and follow the steps. You have to register online as the first step. You'll then receive an account confirmation email to validate your account. Once your account is set up, you can start your entry for each category you have chosen. Save it as you go and return at any time to continue and complete your entry or entries. You can return and amend your entries right up until entry closes on July 31st. For individual members of staff (not companies) in agencies, management companies and auction services. It identifies a special individual – a potential industry leader; who demonstrates enthusiasm, innovation, implementation and leadership qualities. Open only to individuals born since 1st January 1989. The judges look for someone who, for their age, has been exceptionally successful. Enter this category yourself or nominate a colleague. Tell us about yourself: age, where you live, your background, education, qualifications etc. Tell us about your key strengths, your career to date and your ambitions for the future. Tell us your views on the opportunities, risks and rewards in the current property market. Tell us your views on the future of property agency. Tell us about anything else which you feel will help you to win this Award. Open to all agencies, auction houses and management companies. This award celebrates corporate and social responsibility in the community. For example, smaller agencies may be supporting schools, clubs, charities etc. and larger agencies may be engaged in major programmes of community support. The judges look for a lasting commitment and team involvement and action. Tell us why community engagement is important to you and your team. Tell us how you plan your strategy and activities. Tell us what you have done to support your community to date and how it has impacted your agency. Tell us about your plans for 2019 and beyond. Open to agencies, management companies and auction houses. This award recognises a successful marketing campaign in the past year (Since May 2018). The judges look for details of your campaign(s), objectives, creation and implementation and how you measured success. Include facts and figures and illustrations where appropriate. Tell us about your agency and how important marketing is to the business. Tell us how you formulate your ideas and plans for marketing. Tell us about your campaign(s) in the last 12 months. Tell us about the campaign(s) success and your conclusions. Open to agencies, management companies and auction houses. The judges look for excellence and innovation in your website’s appearance, functionality, efficiency, mobility and ease of use. Your website builder should contribute to your entry, explaining technical aspects such as SEO, speed, flexibility. Tell us about your reasons for creating a new website. Tell us what is innovative and special about it. Tell us how your business has grown since you launched this website. Tell us your technical goals and priorities in building the website and how you achieved them. Your website builder should contribute here. Entries may be made by directors or staff who believe that their organisation offers real opportunities, training, support and recognition; fair remuneration and benefits – and a great place to work. Provide details such as: staff long service, recruitment strategy, professional development, mentoring, culture, social calendar, incentives and rewards. Tell us about your business – offices, staff numbers, areas of operation etc. Tell us what you do that makes you the best employer and explain your company ethos and brand values. Tell us how you incentivise and reward your staff. Tell us what your staff members think about the company. Open to sales/lettings agency or property management company – independent or part of a franchise/network etc., launched since 1st January 2017. Provide an overview of the launch, including details of funding, business strategy and growth to date. Tell us about your background and why you decided to open a new agency. Tell us about your company ethos and brand values and what makes your agency stand out from the competition. Tell us about your growth and success to date – e.g. properties let or sold, staffing, local recognition etc. Tell us about your plans for future growth and development. Open to auction houses, independent or franchise/network operating regular live auctions for residential property, at a venue and/or online. Demonstrate growth, innovation and service and include five testimonials from agent clients to support the entry. Tell us about your company’s background, growth and development to date. Tell us about your team and how you work together to build new business. Tell us about your services and your clients/agency partners. Tell us about your plans for growth and development of your services. Open to any residential property management department within an agency. The category covers lettings management departments, block management departments and groups’ management divisions within a lettings agency business. Tell us about your department and how it works within the agency business. Tell us about your systems and innovations and improvements within your department. Tell us about your staff, how you recruit, train and reward them. Tell us about your plans for growth. Open to any standalone residential property management company. The category covers property management and block management operations that are not directly connected to an estate or lettings agency. Tell us about your company’s history and the services that you offer. Tell us about your clients and the developments under your management. Tell us about staff recruitment, training and development. Tell us why you are successful in this very competitive market. If you have a Land & New Homes section (single person or a whole department) you can enter this category. As more agents recognise the opportunities offered in this sector, we’re looking for a team or an individual that is successfully sourcing land, planning development and selling the final product – the homes. Tell us about your company’s history, development and the services that you offer. Tell us about your developer/builder clients. Tell us about your involvement in the sale of the final developments. Tell us how you believe your business will grow in the future. Do you deliver more than you promise? Do your products and services make agents’ businesses fly? Is your technology way ahead of the crowd? Can you demonstrate innovation, quality, service and customer satisfaction? Entries must be supported by five client testimonials. Suppliers may enter up to four categories providing the product or service for each entry is different, eg a company may build apps and supply a general agency management software platform, therefore could enter two categories: Technology – Apps and Agency Software. Open to companies using innovative technologies creating and supplying apps to add to an agency’s management software systems (or standalone) to address/improve particular processes and situations. Tell us about your company’s development, structure and products/services. Tell us about your clients and supply five testimonials from them. Tell us about your most important and successful apps/innovations. Tell us about your views on Proptech in the future. Open to companies providing full agency management software, (lettings sales, or both) bespoke systems or Software As A Service platforms. Entrants should demonstrate user-friendliness, scalability, flexibility, cost-effectiveness and quality of support. The entry should be supported by five testimonials from agent clients. Tell us about your most important software developments. Tell us about your views on future innovation in property software. Open to companies providing, for example: shopfitting, signage, furnishings, utilities, print and design, digital and traditional marketing, PR services, etc. Tell us about your company’s development and products/services. Tell us about your most popular product or service and why it is so successful. Tell us about your plans for the future development of your company. Open to companies providing, for example: legal services, financial, consulting, mortgages, conveyancing, insurance, deposits, ombudsman services, dispute resolution etc. Tell us about your most important and successful services/innovations. Tell us about the future development of your company. 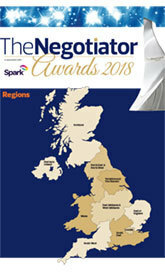 The Regional Awards recognise the best agency in a geographical area, as identified in each Category description. Click on the map for quick reference. Open to any agency, large or small, lettings, sales or both. Regional entrants can also enter the National categories. Northumberland, Tyne & Wear, County Durham, Darlington, Hartlepool, Middlesborough, Redcar & Cleveland, Stockton-on-Tees, Cumbria, Lancashire, Greater Manchester, Cheshire, Merseyside. Tell us about your agency’s history and development to date, your company ethos and brand values. Tell us about your innovation, specialisms, services and your clients. Tell us why and how you lead the market in your region. Lincolnshire, Nottinghamshire, Derbyshire, Leicestershire, Northamptonshire, Rutland, Staffordshire, Shropshire, Herefordshire, Worcestershire, West Midlands, Warwickshire. With a branch or branches within one of the 32 London boroughs, or in the City of London. You must have a branch or branches within the border of Scotland. You must have a branch or branches within the border of Wales to qualify. You must have a branch or branches within the border of Northern Ireland to qualify. Open to all businesses that offer both a traditional no-sale-no-fee option alongside a more limited upfront payment option through their branch(es). What makes this the future-proofed business and how well do you do it? Entrants need to demonstrate to the judges why their hybrid model works for them and their customers. Tell us about the services you offer – traditional and online. Tell us why you believe that your hybrid business model is the best in this market. Tell us about your development plans for the future. The first office of a new agency with great plans – or a well established local single office lettings business. What have you already achieved and what are your goals? How do you make your business compete with larger agencies – and win the business? Tell us your innovations, plans and goals for the future. Tell us how you manage and develop your team. Tell us why your customers choose you – and supply three testimonials. Independent owner/director-run agencies can win the long-term loyalty of clients, with the personal touch, local knowledge and involvement. The judges look for a first class agency that really stands out in their town. Tell us about professional training and development of your staff. With a larger business, economies of scale come into play and help agencies offer a broader range of properties and services, sharing information between the branches, having a larger well-trained and experienced staff. The judges will be looking for a cohesive, successful business that serves its clients well, while consistently building business and developing its staff. Tell us how you attract and retain landlords and help them develop portfolios. Tell us about managing larger portfolio landlords and your services that support them. Large agencies, corporate groups or franchises operating under single or multiple brands may enter this category, either for one brand or the group as a whole, whether regional or national. This is your opportunity to demonstrate excellence on a larger scale. Tell us about your agency’s history, coverage and development to date, your company ethos and brand values. Tell us how your business has grown in strength and profitability through having multiple branches. The first office of a new agency with great plans – or an established local single office sales business. What have you already achieved and what are your goals? How do you make your business compete with larger agencies – and win the business? Tell us about your innovations, plans and goals for the future. Tell us why your customers choose you – and supply testimonials. Tell us about your marketing activity in the press and through social media. Tell us about your range of services, e.g. Land & New Homes, mortgages, conveyancing etc. Tell us about your acquisitions, new departments/services and future plans.. The Negotiator Awards All rights reserved.